With a projected 2017 fiscal year budget of $249,754,989, Sarasota County staff is not anticipating a gap between revenue and expenses, Assistant County Administrator and Chief Financial Officer Steve Botelho told the County Commission during its May 18 budget workshop. Although the preliminary county property value report is not due until June 1 — with the final number required by July 1 under state law — the state is projecting an increase of 7.1 percent, Botelho noted. The state projected an increase of 6 percent in property values in 2015, but the actual change was 7.2 percent. Through the 2021 fiscal year, the only budget for which a revenue gap is anticipated in the general fund is the one for FY 2019, and the amount is $3,548,071, county figures show. That year, according to the model used by staff, the state has estimated only a 6.4-percent rise in property values. Staff is assuming a 3-percent increase from most major revenue sources and a 3-percent rise in expenditures, Botelho noted for the next fiscal year. 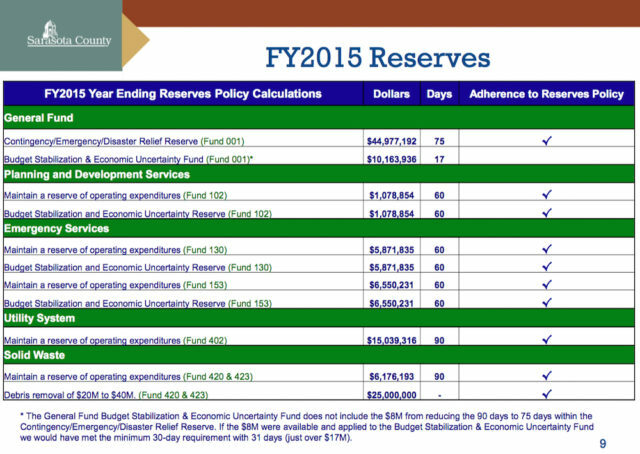 A slide provided to the commissioners showed the county’s Budget Stabilization and Economic Uncertainty Fund with a total of $10,163,936, which represents 17 days of operating money. That does not include about $8.1 million the County Commission set aside several years ago through a reduction in its Contingency/Emergency/Disaster Relief Reserve to reflect 75 days instead of 90 days of operating funds, Botelho pointed out. Earlier this year, when County Administrator Tom Harmer suggested that $8.1 million might be used to start building back up the Budget Stabilization Fund, Commissioner Christine Robinson reminded him that the board decided during its December 2015 retreat to keep the money apart from other reserves in the event it is needed for unforeseen expenses for the 2017 World Rowing Championships, which will be held at Nathan Benderson Park near University Parkway, or for initiatives to serve the homeless population in the county. 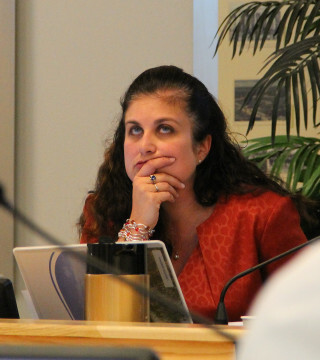 When Maio asked on May 18 whether the budget projections reflect anticipated sales of surplus property the county owns, Harmer told him they do not. 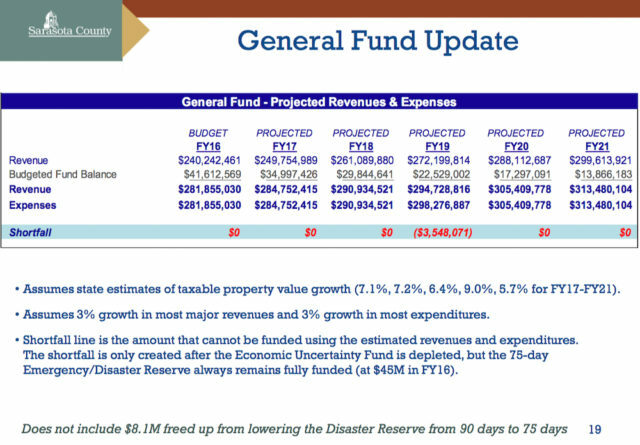 In response to a question from Robinson about the reliability of the general fund projections over five years, Botelho explained, “The first two years are pretty good,” noting that the state provides quarterly updates each year regarding property value changes. A higher estimate for FY19 could erase the $3.5-million gap, he added. “I don’t think I ever envisioned we’d be seeing numbers like this, ever,” Robinson told him, referencing years during the Great Recession when, she said, she and Commissioner Carolyn Mason felt they were “on a cliff,” given the dire revenue and property value projections. 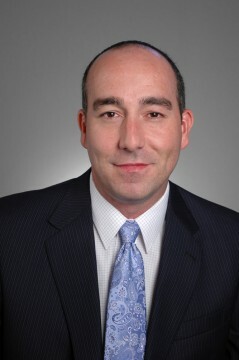 Robinson was appointed to the board in late 2010, while Mason was first elected in 2008. Both will be stepping down in November because of term limits. Robinson reminded him that he has said in the past that as long as an estimated gap between revenue and expenses in a future budget year is below $10 million, he has not found that a cause for alarm. “Anything under $10 million is what we’ve seen in the past [as a number] that fluctuates down significantly,” Botelho replied. Typically, he continued, the county does not spend more than 94 percent or 95 percent of the expenses it budgets each fiscal year. “We can control what we spend,” he added, offering praise to department directors for their handling of their budgets. “To sum it up,” Robinson said, “we’re in pretty good shape,” as long as the board and staff maintain a policy of careful spending, keeping the recession in mind. A graphic staff prepared for the workshop showed $28.1 million was projected to be needed from the Budget Stabilization Fund for the 2014 fiscal year, but the county ended up using only $17.3 million. For the 2015 fiscal year, the anticipation was that $23.3 would be needed, but a one-time settlement from BP for effects of the 2010 Deepwater Horizon oil spill in the Gulf of Mexico resulted in the need for only about $100,000 from the reserve fund. 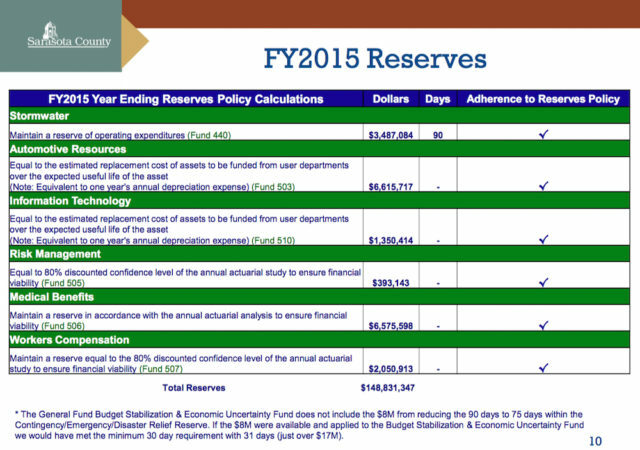 At one point, Maio asked Botelho why the slide showing the total of the county’s reserve funds — $148,831,347 — did not include the interest that had accumulated. When he speaks to homeowner organizations, he told Botelho, he quotes a figure of $157 million to $158 million, which reflects the interest. “We could asterisk it,” Botelho responded. During his presentation this week, Botelho took the opportunity to explain that about eight years ago, county staff created the budget software model it uses for projections. Since he began demonstrating it at conferences, he continued, he has seen similar models produced for other Florida counties. He was convinced, he said, that if all counties had been employing such software during the recession, a number of them might not have felt the need to raise their millage rates. Without such software, though, he noted, they were not able to predict their revenues and expenditures with as much accuracy. Harmer reminded the board that their next budget workshops will be held June 22 and 23, with the constitutional officers — Sheriff Tom Knight, Tax Collector Barbara Ford-Coates and Supervisor of Elections Kathy Dent among them — will present their funding requests for the 2017 fiscal year. The commission will be asked to set the not-to-exceed millage rate on July 13, with public hearings scheduled on the budget on Sept. 12 and Sept. 21, prior to the adoption of the 2017 fiscal year budget on Sept. 21.